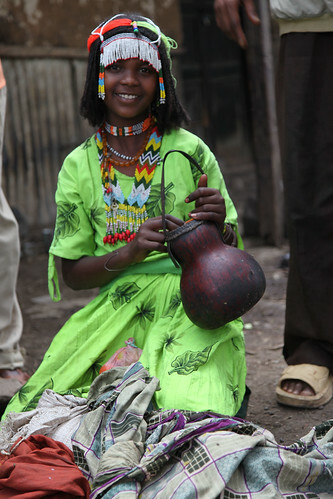 Kemeria Hussien, a young woman at a milk market in Meisso District, West Hararghe Zone, Ethiopia, 2011 (photo credit: ILRI/Apollo Habtamu). 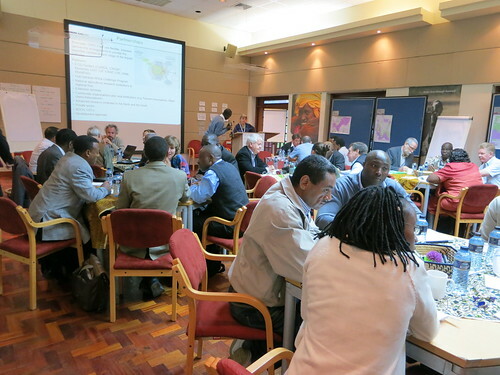 On 28 March 2013, a team from the project ‘Improving Productivity and Market Success of Ethiopian farmers (or IPMS project) gave a ‘livestock live talk’ seminar at the Addis Ababa, Ethiopia, campus of the International Livestock Research Institute (ILRI). 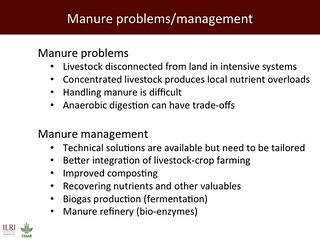 This seminar, given for 70 people physically present and a few more connected virtually via WebEx, happened in the middle of the research planning workshop for a project that is a ‘sequel’ to IPMS, called ‘LIVES’: Livestock and Irrigated Value chains for Ethiopian Smallholders. ILRI staff members Dirk Hoekstra, Berhanu Gebremedhin and Azage Tegegne have been managing IPMS, and learning from it, since its inception in 2004. 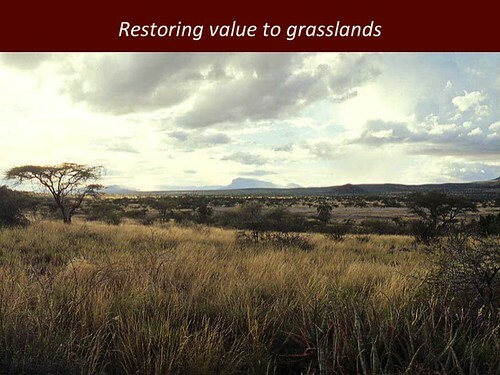 The legacy as well as the learning from the IPMS project will be applied in the LIVES project, as well as other initiatives led by ILRI and other parties involved in IPMS. IPMS relied on developmental (uncontrolled) as well as experimental (controlled) research activities, which ranged along the spectrum of diagnostic, action-research and ‘impact research’ activities (so-called for the expected development impact they would have). 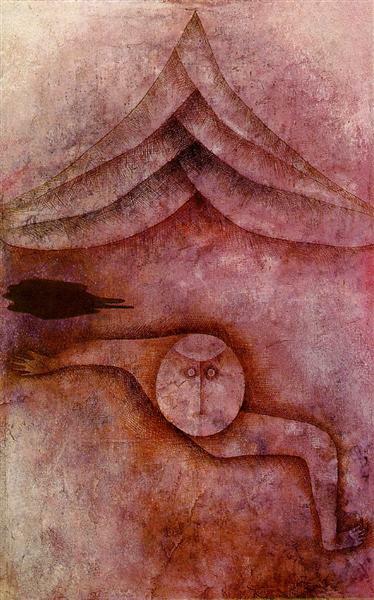 Some activities were outsourced to development partners rather than undertaken by the research team. The project worked along entire value chains, from crop and livestock farmers and other food producers to rural and urban consumers, with the team restricting itself to introducing and facilitating the implementation of interventions validated by local stakeholders. Rather than focus on value chain interventions exclusively, the IPMS researchers investigated farming production systems as a whole and focused on the role of agricultural extension in the uptake of research results and their integration in interventions. 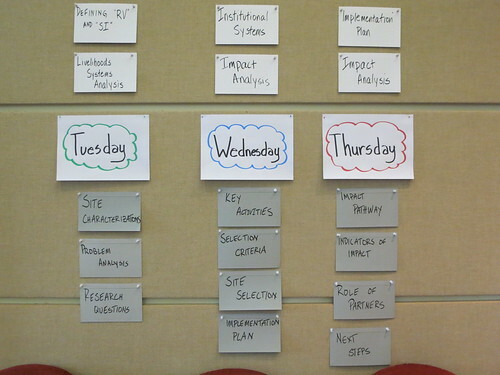 The IPMS workers used ‘action learning’ methods, which appears to have enabled an on-going evolution in the development of their targeted value chains. This kind of learning approach also sped the adoption of new technologies and the implementation of interventions and encouraged the team to use failures as fuel to modify the project’s trajectory.
. . . Led to what insights? Insights from the project team were at the core of this ‘live talk’, with the lessons IPMS learned simple and straightforward; some examples follow. 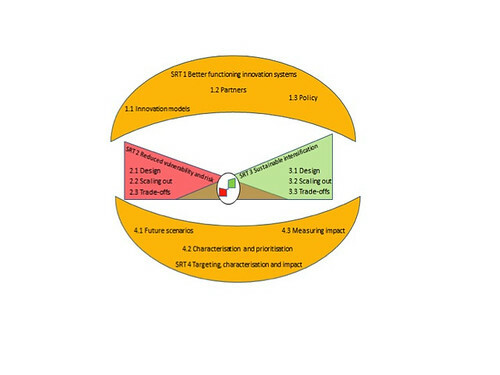 Technology generation by itself is not enough to achieve developmental outcomes and impacts – Several interventions in the value chain development approach need to be implemented together to achieve impact. Research for development can be implemented well in a research environment, i.e., it is possible to combine rigorous research with development processes without sacrificing the quality of scientific research or the generation of robust evidence. Knowledge management and capacity development—using, among other methods, innovative information and communication technologies and approaches such as farming radio programs, local information portals connected to local knowledge centres and e-extension—are key to development of responsive extension systems as well as women and men farmers working to transform subsistence agriculture into sustainable economic enterprises. 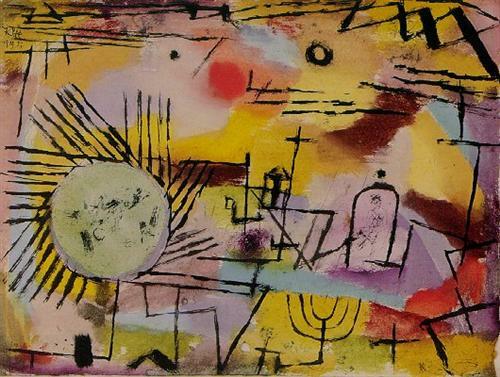 Gathering those lessons was itself far from straightforward. 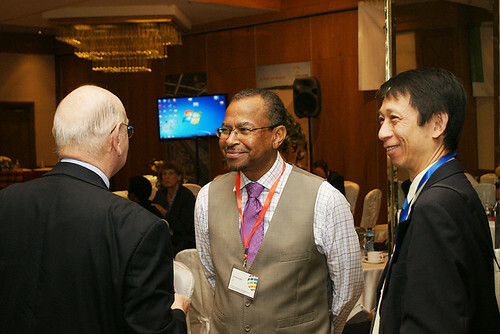 The IPMS team experienced difficulties in negotiating value chain developments and the specific interventions that were felt as necessary, and in making choices among all actors involved in the value chain (e.g., a failed experiment to market sunflowers) because of market failures and insufficient returns on investments. 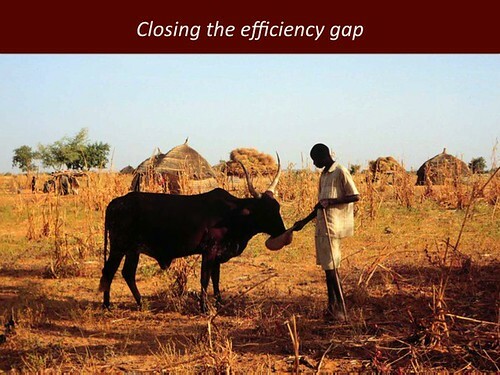 The team also realized that working in an adaptive manner across a broad value chain and extension framework implies letting go of control and of tight deadlines, but can improve relations among value chain actors and their joint interventions. 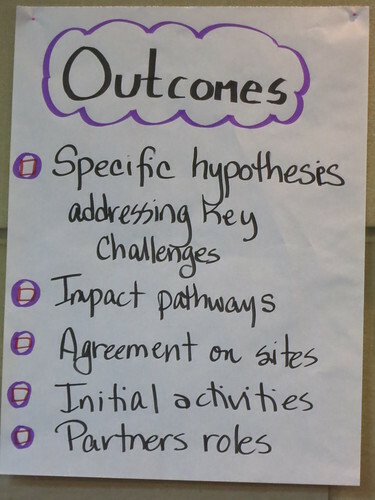 As ILRI’s new LIVES project is now in full swing, and as a new long-term ILRI strategy demands that ILRI take a more coherent approach to making development impacts, these insights from IPMS can help guide those undertaking new initiatives of ILRI and of its partners. 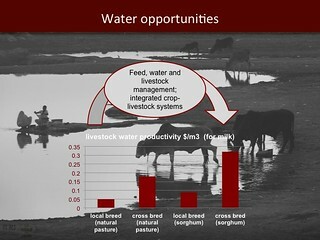 Watch and listen to this seminar here: http://www.ilri.org/livestream. 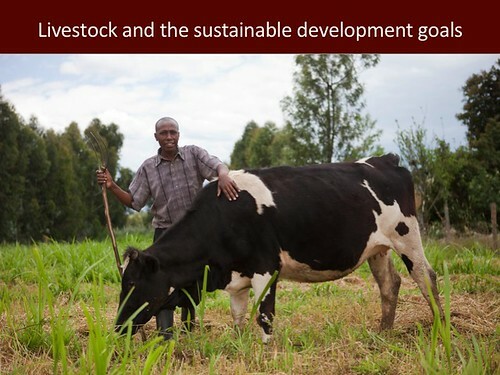 View the slide presentation here: Agriculture research for crop and livestock value chains development: the IPMS experience, presentation by Dirk Hoekstra, Berhanu Gebremedhin and Azage Tegegne on 28 Mar 2013. You can contact the IPMS/LIVES team at lives-ethiopia [at] cgiar.org. 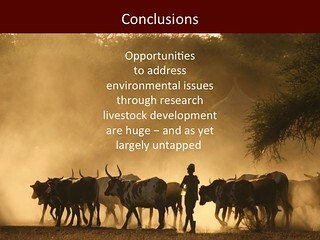 Note: ‘Livestock live talks’ is a seminar series at ILRI that aims to address livestock-related issues, mobilize external as well as in-house expertise and audiences and engage the livestock community around interdisciplinary conversations that ask hard questions and seek to refine current research concepts and practices. 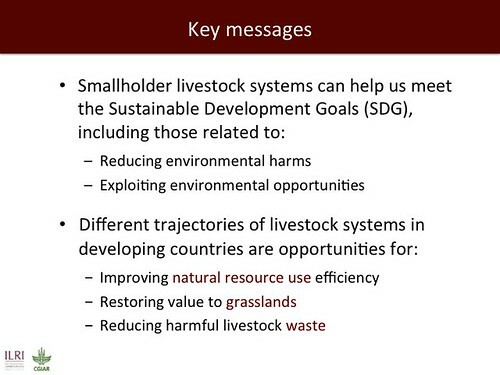 Taking the long livestock view, slide presentation by ILRI director general Jimmy Smith. 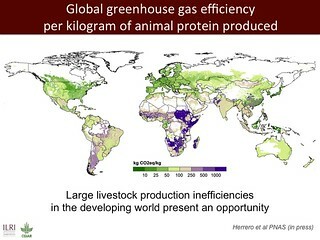 View this slide presentation, Taking the Long Livestock View, made by Jimmy Smith, director general of the International Livestock Research Institute (ILRI), at the Third Stakeholder Meeting of the Global Agenda of Action for Sustainable Livestock Sector Development, held in Nairobi, Kenya, on 22 January 2013. 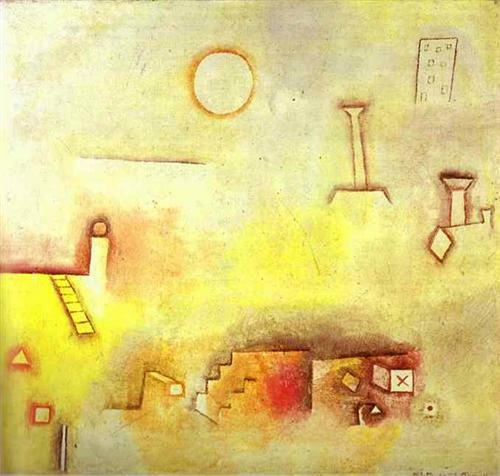 What follows is the gist, but view the presentation itself to get the affecting imagery. 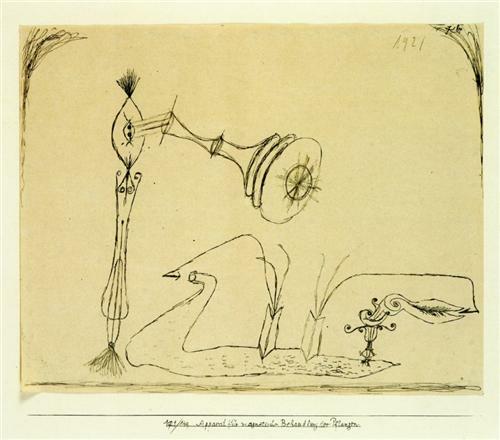 ‘Long before recorded history, people depended on animals for their survival. Some seven to nine thousand years ago, people domesticated large herbivores. Evidence suggests that cattle domestication occurred in Africa as well as Mesopotamia (Iraq) and the Indus Valley (Pakistan). This animal domestication helped bring about the agricultural revolution. 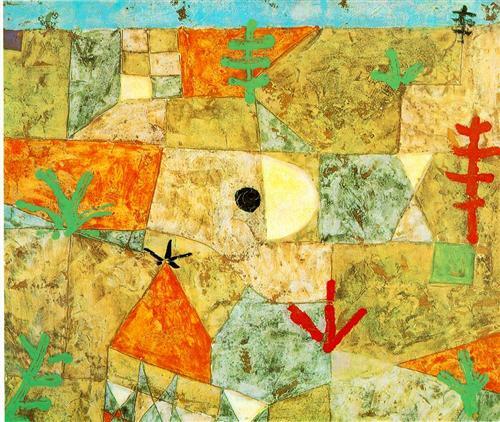 ‘Only during the last century did perceptions of the benefits of animals begin to diverge. People in more developed regions of the world began separating from the animals they raised and consumed. 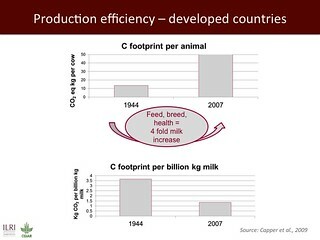 This is reflected in the “factory farms” of industrialized and industrializing parts of the world. ‘But people in less developed regions (mostly the South — especially in Africa and Asia) maintained close relations with their domesticated animals, which shared their farm compounds and scarce resources to support their livelihoods. 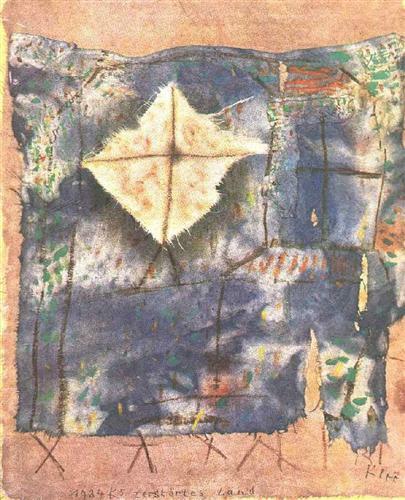 ‘Thus, today perspectives on the value of livestock diverge, depending on whether people: (1) are poor or rich, (2) eat too little or too much and (3) live with or away from livestock. 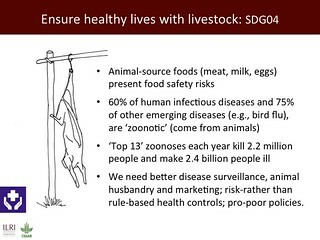 • Livestock production and marketing remain essential to 1 billion people. 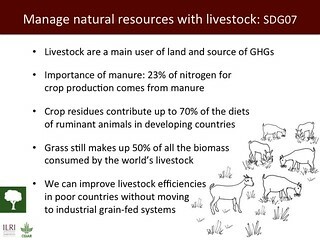 • 80% of the world’s livestock foods are generated on small farms, mostly those mixing animal raising with crop growing, and sold in informal markets. 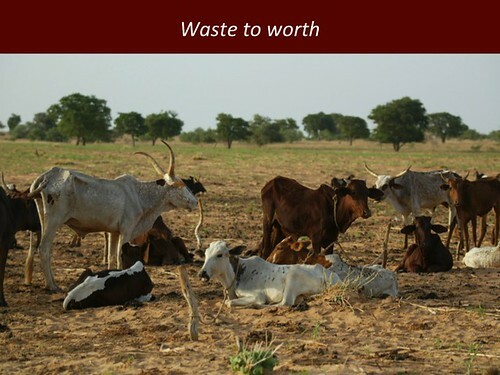 • 80% of Africa’s poor keep livestock, which contribute at least one-third of their annual income as well as other benefits (e.g., food, manure, traction). 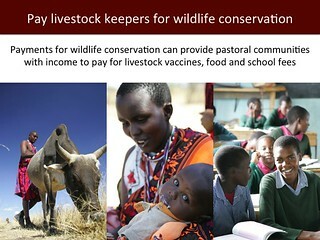 • Livestock are central to the lives and well-being of developing-country women, children and households. 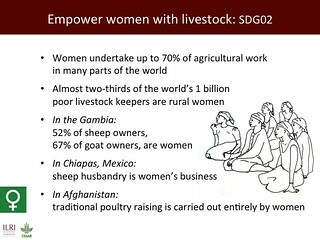 • Women livestock producers, processors and sellers are essential to developing-country economies. 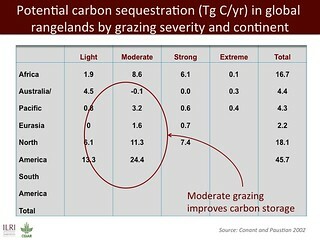 • and at 11−12% annually in eastern Europe and Latin America. • costing their owners on average USD800 per animal per year. 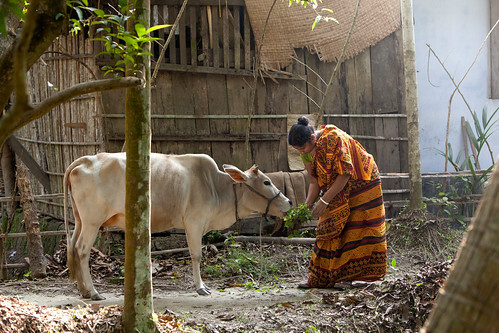 ‘As animals for food became divorced from animals for companionship in the U.S. and other rich countries, and have begun to be similarly divorced in urban areas of fast-developing countries, it is livestock that remain important to poor communities. ‘Now there is an added source of tension between those who can over-consume livestock and other foods and those who cannot. 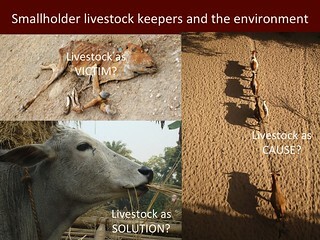 For many who have escaped poverty, environmental issues in the livestock sector are now paramount. For those who remain in absolute poverty, what is paramount is getting enough to eat, making a living, staying healthy. 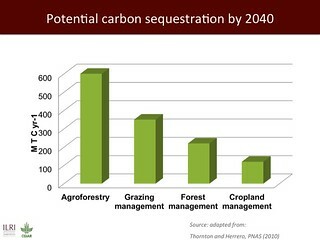 ‘So for those now divorced from livestock, the narrative is: If we want to save the planet, we should get rid of the livestock. And to preserve our health, we should stop eating meat. ‘But the on-going demand-led ‘livestock revolution’ happened fast. 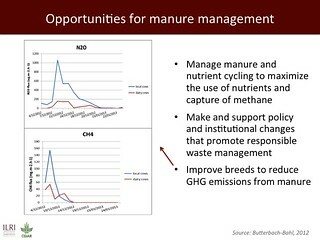 Green and equitable policies/incentives haven’t caught up with livestock practices. The livestock revolution of the South may slow but it will not stop. 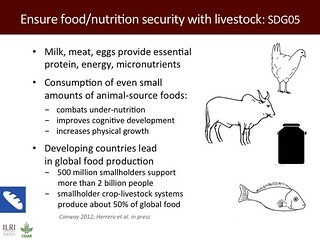 Some estimates show that demand for livestock foods will rise more than 100% in the next 30 years (and poultry by 170% in Africa). 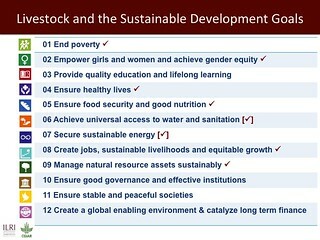 ‘Those of us working in livestock for development can ensure that we approach livestock development as a transitory pathway out of poverty. 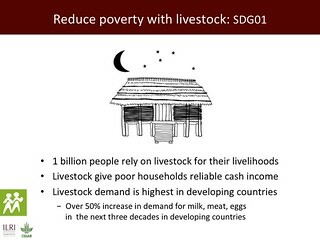 And we can, and must, support many poor people in exiting the livestock sector in the coming decades. 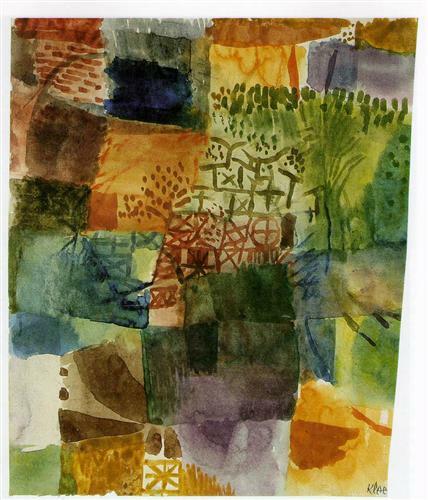 • Work explicitly toward ‘inclusive growth’ that is both sustainable and equitable. 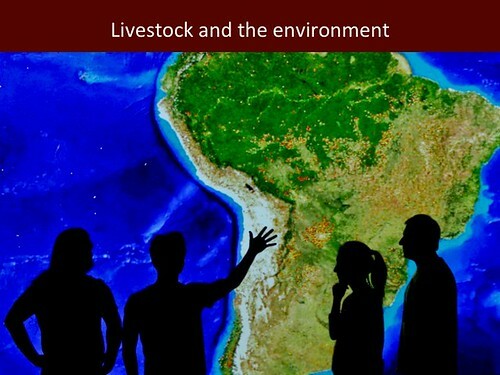 • Find practical and equitable solutions to environmental problems. 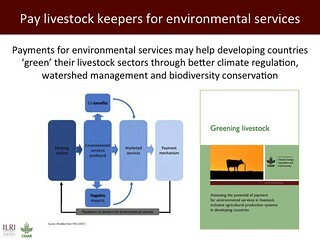 • Provide evidence to guide livestock investments. 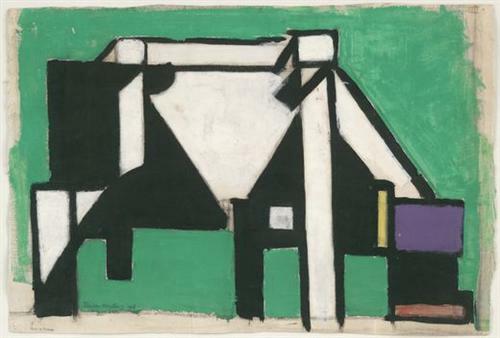 ‘Our concern for the environment needn’t override our concern for the world’s poor. 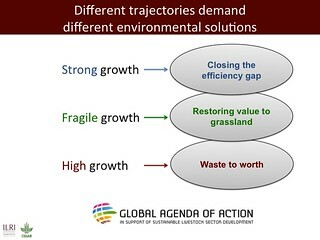 Read more on the ILRI News Blog about the Global Agenda of Action in Support of Sustainable Livestock Sector Development and its Third Stakeholder Meeting, held in Nairobi, Kenya, on 22 January 2013: Greening the livestock sector: ‘Game changers’ for environmental, social, economic gains, 22 Jan 2013. 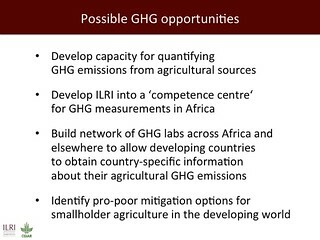 A new research for development project was launched today by the International Livestock Research Institute (ILRI) and the International Water Management Institute (IWMI), both members of the CGIAR Consortium. 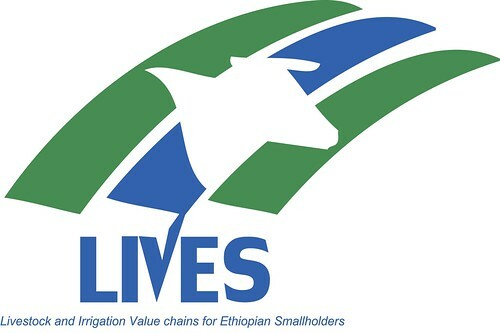 Entitled ‘Livestock and Irrigation Value chains for Ethiopian Smallholders – LIVES’, it will directly support of the Government of Ethiopia’s effort to transform smallholder agriculture to be more market-oriented. Supported by the Canadian International Development Agency (CIDA), the LIVES project is jointly implemented by ILRI, IWMI, the Ethiopian Institute of Agricultural research (EIAR), the Ethiopian Ministry of Agriculture and regional Bureaus of Agriculture, Livestock Development Agencies, Agricultural Research Institutes and other development projects. Ethiopian State Minister of Agriculture H.E. Wondirad Mandefro welcomed the project, asserting that it will directly contribute to both the Growth Transformation Plan (GTP) and the Agricultural Growth Program (AGP) of the Ethiopian Government. 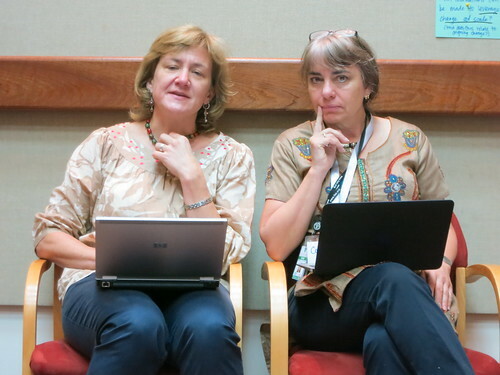 Canadian Head of Aid, Amy Baker expects this investment to generate technologies, practices and results that can be implemented at larger scales and ultimately benefit millions of Ethiopian smallholder producers as well as the consumers of their products. Canadian Ambassador David Usher noted that the project will contribute to Ethiopia’s efforts to drive agricultural transformation, improve nutritional status and unlock sustainable economic growth. LIVES is also a reflection of Canada’s commitment to the 2012 G-8 New Alliance for Food and Nutrition Security which will allow Ethiopia, donors and the private sector create new and innovative partnerships that will drive agricultural growth. LIVES actions will take place over six years in 31 districts of ten zones in Amhara, Oromia, Southern Nations, Nationalities, and Peoples and Tigray regions, where 8% of the country’s human population resides. 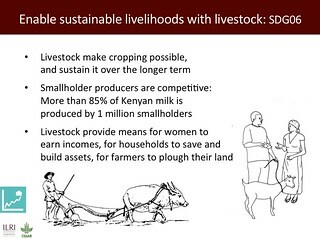 LIVES will improve the incomes of smallholder farmers through value chains development in livestock (dairy, beef, sheep and goats, poultry and apiculture) and irrigated agriculture (fruits, vegetables and fodder). 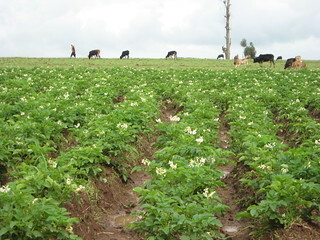 The project, with a total investment of CAD 19.26 million, aims to directly and indirectly benefit more than 200,000 households engaged in livestock and irrigated agriculture, improve the skills of over 5,000 public service staff, and work with 2,100 value chain input and service suppliers at district, zone and federal levels. 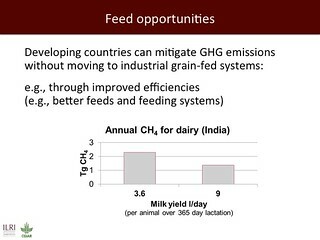 The project will focus on clusters of districts, developing and improving livestock production systems and technologies in animal breeding, feed resources, animal nutrition and management, sustainable forage seed systems, sanitation and animal health, and higher market competitiveness. Potential irrigated agriculture interventions include provision of new genetic materials, development of private seedling nurseries, work on seed systems, irrigation management, water use efficiency, water management options, crop cycle management, and pump repair and maintenance. The main components of the project are capacity development, knowledge management, promotion, commodity value chain development, and documentation of tested and successful interventions. Gender and the environment will be integrated and mainstreamed in all components of the project.